Contractor - T. A. Loving, Inc.
An expansion of the North Carolina State Port Facility at Wilmington, NC involved the use of six cellular cofferdams as earth retention structures during dredging and final filling operations. The sheet piles for the 62 foot diameter cofferdams were driven through 5 to 60 feet of extremely soft silty clay river sediments and a minimum of 3 feet into cemented sand (marl) substratum. The cells and connecting arc were then filled with to final grade with sand. To obtain the required stability it was originally planned to excavate the very soft river sediments from inside the cofferdams down to the marl, and then fill the cells with sand. Under this scheme it would have been necessary to internally brace the cofferdam. To eliminate the need for this excavation and bracing, the contractor asked for and was granted permission to stabilize the existing soil inside the cofferdams by installing stone columns. Columns were installed inside the cells at spacings ranging from 7 to 10 feet. Wick drains were installed intermediate to the stone columns to further accelerate consolidation of the soft sediment. Lateral deformation measurements taken during and after construction indicated essentially no movement of the cells. 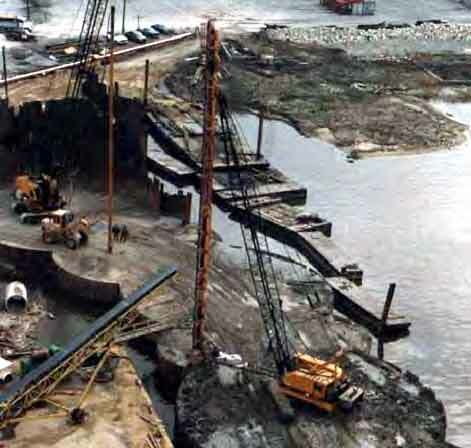 The cost for the stone columns and wick drains was one-fourth the cost for excavation and replacement of the soft soils inside the cofferdams.